An interloper from the Sierra de Gredos – the mountains to the West of Madrid on the border with Castilla y Leon, this got a run out at dinner last weekend (in Der Guerrita) due to its “crianza biologica” (biological ageing). It is by the Comando G – yet another young, terroir focussed group of winemakers who in this case are rescuing grenache (garnacha) from a life in servitude as a “workhorse” grape . 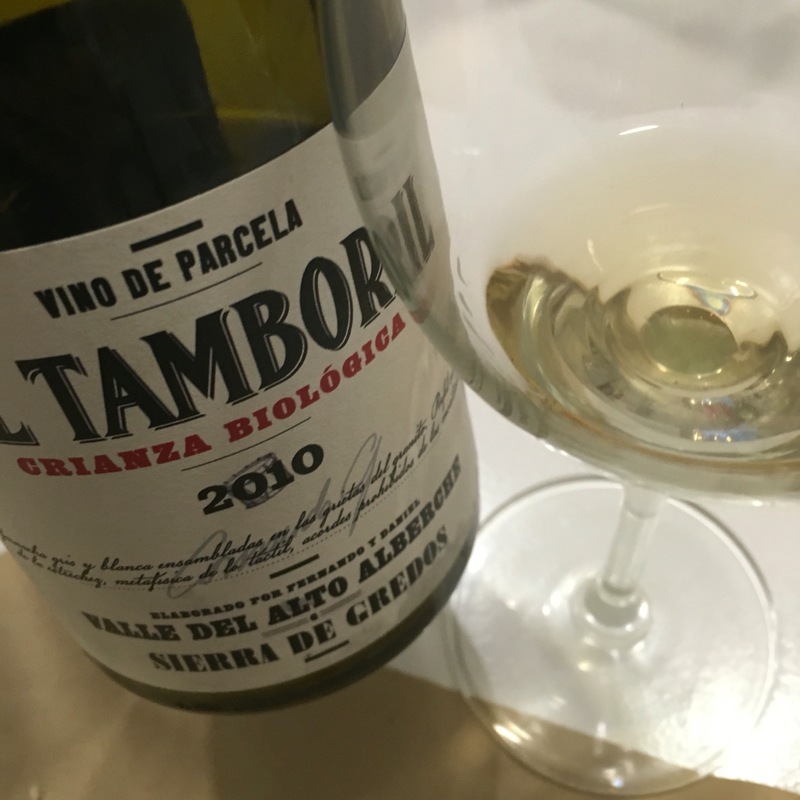 They are probably the trendiest thing in Spanish wine right now – but the wines are excellent (read this write up by Spanish Winelover for a flavour). So this is white and grey grenache from 60+ year old vines in a North facing vineyard at 1230 meters. Fully artisan and biodynamic, it has apparently spent at least some time in demijons under flor, along the lines of a Jura (although I really have not found much by way of a ficha). It is good stuff alright – very lemony in colour and character, with a buzz to it as if it was a white with maceracion carbonica. It is also potent, but you get the feeling that the biological ageing has taken the aromatics from the grenache a little. The result is really not comparable to a fino or a manzanilla (or the real vin jaune and Chateau Chalon that we unfairly matched it with) but on its own merit it is an attractive, characterful wine.